Speaking of things for which I feel thankful… I have to give thanks for my mother in law, who knitted this awesome hat that I requested, and for my son who is willing to wear it. The back story, is that I was reading my friend Aurora’s blog, and she mentioned pinterest in this post. That led me down the rabbit hole of pinterest and soon I was sending this picture to Laura asking her to teach me to knit. She said she would. Then I realized I was probably never going to knit that awesome beard hat, so I emailed my awesome mother in law with the link. 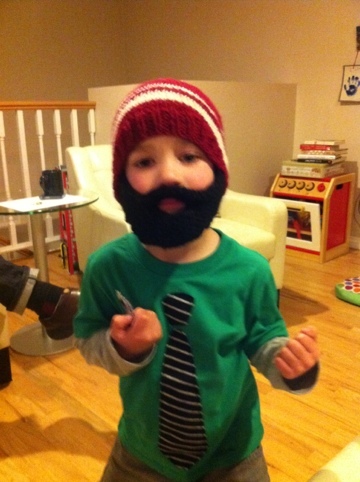 Now, two short months later, Jack is in possession of a beard hat. This entry was posted in Projects, Uncategorized on November 25, 2011 by metamegan. that is incredible. Way to go, Grandma!!! I need to see a picture of Dave and Jack in that hat together. the family resemblance is uncanny. It goes perfectly with that equally awesome shirt!